With Music: The Art of Listening, students practice engaging with music critically, and with an appreciative ear. Presenting music within a broadened cultural and historical context, The Art of Listening encourages students to draw on the relationships between: music and the other arts; musical characteristics of different periods; as well as Western music and various non-Western music and concepts. Listening Examples in Connect Music from Music: The Art of Listening walk students through key works taken from classical music, American musical theater, and jazz. Students not only listen to the piece but have instant access to information regarding its composer, genre, and lyrics, as well as a visual representation of the piece’s structure. Listening Activities in Connect Music allow instructors to access the development of students’ listening skills at any time, without waiting for midterm for an update on students’ progress. Activities range from comparison and connection exercises to audio click/drags. Learning objectives link to chapter sections, and in turn, to activities in Connect Music, so that students can immediately assess their mastery of the material. Music: The Art of Listening provides seamless access to the music referenced throughout the program. Every musical selection is available for instant streaming in Connect Music, as well as being available offline in the new Digital Music Collection, for portable listening devices. New to this edition is a Digital Music Collection—all of the audio selections discussed in the text are available on a single disc in high-quality digital form. This new format replaces that multi-disc audio CD set and makes accessing the music on computer or portable player easier than ever. Eight new music selections, including: “Stars and Stripes Forever,” “Le Bananier,” “I Dream of Jeanie with the Light Brown Hair," “Flora,” “Imperial March” from The Empire Strikes Back, Excerpts from The Day the Earth Stood Still score, "Hotter Than That," and "Boplicity." New to the ninth edition, Listening to Art draws further comparisons between music—which students experience through listening—and a multitude of visual art forms. A contextual approach discusses music in the context of the society that surrounds it. Ferris's approach minimizes the need for musical notation in the text and instead emphasizes the way the lives and times of composers influence their work. Full color photos and line art throughout: These not only enhance the visual appearance of the text, but illustrate concepts of style applicable to music as well as the visual arts. Listening Guides in the text navigate students through the music in Listening Examples moment-by-moment, giving them the confidence that they are hearing precisely what they are listening for. 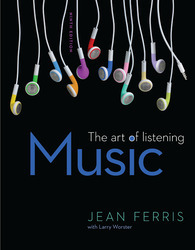 Connections at the end of many chapters relate the topic at hand to music from another culture, providing readers with additional perspective on the music they have just studied. Encore: Appearing at the end of the chapter, this feature provides suggestions for viewing and reading as well as listening. Larry Worster (B.S., St. Lawrence University; B.A., University of Colorado at Boulder; M.M. University of Colorado at Boulder; Ph.D., University of Colorado at Boulder) is a Professor of Music at Metropolitan State College of Denver. He taught previously at the University of Colorado, Regis College, and Denver University. He performed for ten years (1984-94) in the Irish folk ensemble Colcannon. Dr. Worster has been active in the leadership of the Rocky Mountain Chapter of the College Music Society, the Society for American Music, and the Board of Directors of the Boulder Bach Festival. He is the author of Cecil Effinger: A Colorado Composer published in 1997 by Scarecrow Press. He has published articles in the American Music Research Center Journal and the Sonneck Society Bulletin and presented papers at conferences of the American Musicological Society, Sonneck Society, and the College Music Society. His ChartCreator software is published as shareware at www.chartcreator.com. Six customized sets of ChartPlayer software for the support of general studies music textbooks have been published by McGraw-Hill.